Wolseley, which finally went out of business in 1975, was founded in 1901 by Vickers, the former British armaments manufacturer. Early on, they were known for their luxury cars. So when Wolseley designed a light car, Vickers decided to have it produced by another company under their umbrella: the Electric & Ordnance Accessories Co. And it would be a separate marque, Stellite, to preserve the Wolseley brand. The Stellite was powered by a 1.1-liter straight-four rated at nine horsepower. Cruising speed was a comfortable 30 mph and at launch only two-seater convertibles were offered. 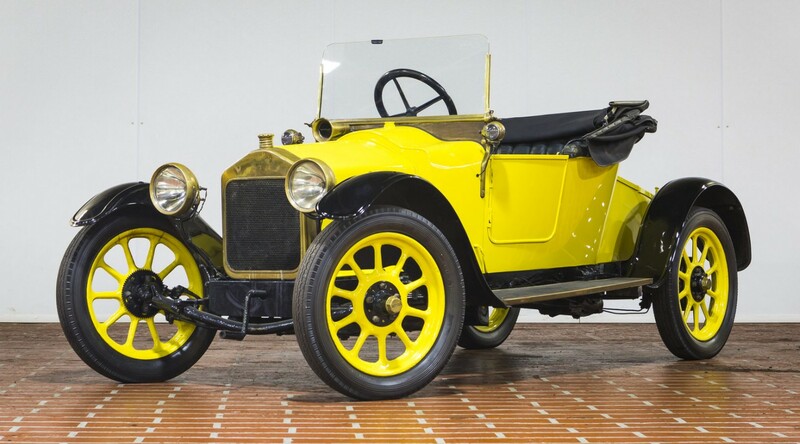 The car was introduced for 1914 and went out of production once WWI started. It reappeared briefly after the armistice but was quickly replaced by the 1920 Wolseley Ten. Stellite was a short-lived British marque that was directly related to one of its oldest. Even Mecum’s catalog lists this as a “Wolseley.” They’re very rare, but not unheard of and this one should probably sell in the $15,000-$30,000 range. Click here for more info and here for more from this sale. Update: Not sold, high bid $10,000. Update: Sold, Mecum Chicago 2017, $3,500. Update: Sold, Mecum Kansas City 2017, $3,750. NOTE: Dear owner, I’ve $$$ (more than you’re getting at auction) right now for this car. Just email me. This entry was posted in Uncategorized and tagged 1914, 8/10hp, auctions, cars, classic cars, mecum, stellite by classiccarweekly. Bookmark the permalink.